You have added Lace Luxe Fitted Dress in Navy/Beige into shopping cart. This flirty lace dress has a flattering square neckline and sleeves that can be worn on or off the shoulder. The Lace Luxe Fitted Dress is fully lined, except for the sleeves which are semi-sheer. It has a square neckline, princess seams, and a fitted cut that will hug your curves. We love that this dress has a slightly longer length hemline, keeping the look sophisticated and chic. A hidden back zipper completes this dress. 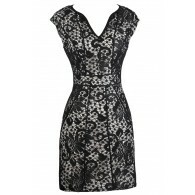 The Lace Luxe Fitted Dress would look nice paired with beige pumps or strappy heels and a clutch. Try wrapping a belt or fabric sash around the waist to create a contrasting new look. This is a chic and flirty dress that would make a cute party dress. Details: Fully lined, except at sleeves. Hidden back zipper. 92% nylon, 8% spandex. Dry clean. Do not bleach. Do not tumble dry. Do not iron. Small measurements: Length from top of shoulder to hemline: 35". Bust: 32". 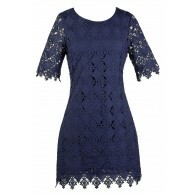 You have added Lace Luxe Fitted Dress in Navy/Beige into Wishlist. You have added Lace Luxe Fitted Dress in Navy/Beige for Stock Notification. 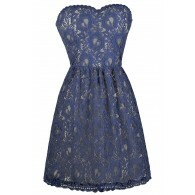 You have set Lace Luxe Fitted Dress in Navy/Beige as a loved product. 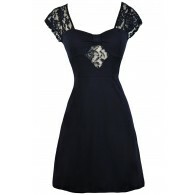 You have removed Lace Luxe Fitted Dress in Navy/Beige as a loved product.